Ray’s Donuts is one of the restaurants in Branson that offer a wide variety of specialty donuts as well as coffee and other delectable treats. The donuts served in this restaurant are made fresh by hand daily and are currently delivered to motels, gas stations, condos, churches and other businesses. Ray’s Donuts has everything of a delicious donuts of many variations and drinks to finish it off. If you want to spend a nice afternoon with some friends for laughter, drop by Ray’s Donuts in Branson. This great restaurant in Branson offers free donut for every purchase of any drink but excludes specialty donuts. 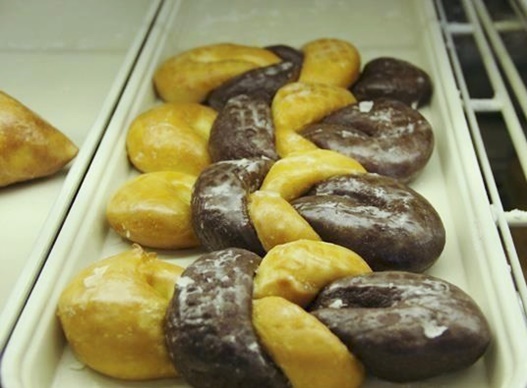 Different flavors are offered everyday at Ray’s Donuts. Flavors offered for Monday include Cherry Bizmark, Blueberry Bizmark, Pumpkin Cake; Strawberry Bizmark, Lemon Bizmark, and Orange Cake for Tuesday; Raspberry Bizmark, Key Lime Bizmark, and Chocolate Chip Cake for Wednesday; Cherry Bizmark, Blueberry Bizmark, and Orange Cake for Thursday; Chocolate Bizmark & Long-John, Strawberry Bizmark, and Pumpkin Cake for Friday; Raspberry Bizmark, Strawberry Bizmark, and Chocolate Chip Cake for Saturday; Lemon Bizmark, Strawberry Bizmark, and Cherry Cake for Sunday. If you have tasted the delicious donuts in this restaurant in Branson, you can say it’s the best that you’ve ever had and you are sure to come back for more. The restaurant may not look attractive but it seems clean and it has a comfortable booths. The time you are seated and served with delicious donuts, the serving staff will chat with you about interesting things in Branson. If you consider yourself a doughnut connoisseur, this is the place to go where you are sure to have the freshest, tastiest donuts in town. All they do in this restaurant is doughnuts, so they can make them very well and delicious. They offer a variety of donuts including glazed sour cream, a maple long john without filling, a chocolate frosted cake doughnut, an apple fritter, a cinnamon twist, and a lemon filled which are all delish. If you love donuts, try to insist on Ray’s Donuts – they are really fantastic. Ray’s Donuts has a great selection of donuts and their rolls are huge. Every single one of the rolls is really delicious and they stayed fresh for several days which are usually not the case with donuts. When you visit any location of Ray’s Donuts, you will be surprised with the warm reception of the staff, specially a happy bunch of servers and cooks. When you stop in this restaurant and try their donuts, you are sure to be fully satisfied with its taste along with quality service with the happy people – such a fun place to visit. A nice donut shop with a great selection of donuts to choose from. At Ray’s Donuts, you will find every kind of donut from cake to crullers to raised to bismarks. If you want to taste some delicious donuts, coffee and laughter on a summer afternoon with friends, visit Ray’s Donuts in Branson where donuts are made fresh by hand daily.